...Turns out we're bad vebters. There's an irony I haven't missed about bemoaning the practises of veterinary surgeons when Nilla's talking about proper healthcare issues. I should insert a "but" here before commencing moan "but" I can't think of one so I'll pretend to have missed the irony and hope no one notices. I took the hound to vets today to have a lump checked (it's a harmless cyst good news) but the vet surgery we use are ball bags so I phoned up another that's closer anyway, went through all the usual rigmarole of registration then they took the name of the other surgery he was registered to. Not 5 minutes later they phoned back and told me they had his records from the previous vets but their accounts indicated that we had failed to pay his fees upfront on two occasions . 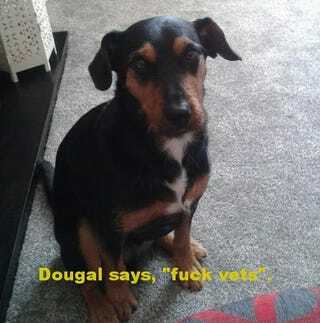 Fair dinkum 5 years ago I took Dougal to the vets expecting an invoice through the post and didn't realise you had to pay upfront and some two years back Mrs wing took didn't put her credit card in her bag and had to call by the next day. But really a 'courtesy call' all but telling me "bring your wallet with you, you tight fucker". One day I hope to get a call from a panicky veterinarian telling me they've lost all power to office, I'll get my £28 back for the 5 minute appointment.